Hours before Amazon announces its newest Kindle devices, Kobo has snuck in an e-reader and tablet announcement of its own. The ebooks underdog will soon launch three new devices, including a pocket-size e-reader and a $200 Android tablet. Unique in the lineup is the Kobo Mini, an $80 e-reader with a 5-inch E-Ink touch display. That’s about an inch smaller than the screen on Amazon’s and Barnes & Noble’s basic e-readers, and Kobo says the device is small enough to fit in the pocket of a pair of pants. The Kobo Mini can store about 1000 ebooks, and lasts two weeks on a charge with Wi-Fi turned off. Kobo still sells it larger e-reader, the 6-inch Kobo Touch, for $100, and now the company is adding a front-lit option called the Kobo Glo for $130. Both devices have roughly the same specs, including storage for 1000 books, a MicroSD card slot and a month of battery life with Wi-Fi turned off. The Kobo Glo has an adjustable light that, when turned on, provides up to 55 hours of continuous use. 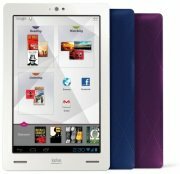 Finally, there’s the Kobo Arc, a $200 tablet running Android 4.0. Specs include a 7-inch, 1280-by-800 IPS display, a 1.5 GHz dual-core processor, 1GB of RAM, a 2-megapixel front-facing camera and 10 hours of battery life while reading. The $200 model comes with 8GB of storage, and a 16GB model will cost $250. There’s not much here to make the Kobo Arc more attractive than Google’s Nexus 7—or whatever Amazon announces next—but it does have some special apps to improve the reading experience, including a Web browser that formats articles in a clean, ad-free view and an app called Tapestries that lets you organize content and suggests new things to read. The new devices are available for pre-order now, and Kobo says they’ll ship in October. This story, "Kobo preempts Amazon with new tablet, e-readers" was originally published by TechHive.